Is Drinking for Thirst the Best Hydration Advice? Adequate hydration is crucial for performance in active people. In the body, water acts as a solute and solvent; a carrier, coolant, shock absorber and more. During exercise, water protects working muscles from overheating by circulating heat and redistributing it throughout the body via the bloodstream. Sweat, which is mostly water, evaporates off the skin to help release that heat and cool your core temperature. The longer a workout lasts, the more water is lost through sweat and therefore must be replaced to allow the body to continue to do the important job of cooling. When it comes to how you should hydrate during exercise to prevent large weight losses and dehydration there are two approaches: following a “schedule” to replace fluids or simply relying on thirst to guide fluid intake during and after exercise. Below, we explain these approaches in more detail — and offer tips to help you develop the best hydration plan for you. Static fluid recommendations, somewhat independent of thirst, have been used to guide athletes on the proper amount to consume before, during and after workouts to prevent dehydration. The biggest reason for such recommendations is actually a small innate “problem” with thirst. Your thirst is triggered after we become slightly dehydrated (approximately 1.7–3.5%). This means that an athlete might already be on their way to a state of significant dehydration when their thirst mechanism kicks in. In addition,stopping to drink when thirsty may not be feasible for some athletes. Or even more likely, an athlete may not be in tune with their thirst drive due to focusing on their training or competition. Climate is another factor that challenges your thirst mechanism. When exercising in very hot weather (high 90s and above), your thirst may not be a strong enough drive to replace the water lost from sweat. Surprisingly, cold weather (41°F degrees or lower) also poses a challenge because it can increase the level of dehydration required to initiate thirst. You should therefore be vigilant about fluid intake in either very hot or cold temperatures. For all these reasons, the most widely used fluid recommendations encourage athletes to not rely solely on thirst to guide their intake. Rather you should implement a regular rhythm of fluid intake that has been practiced and mastered in training and leads to a desirable performance outcome. This might look like drinking 4–6 sips of fluid every 15–30 minutes, regardless of thirst. Strict rehydration rules should also be followed after a workout to compensate for water-related weight loss. While those recommendations are a great starting place, some research suggests that athletes, particularly endurance athletes, need more individualized guidance that is driven by the body’s natural signals of thirst. Even though thirst is initiated after mild dehydration, some studies show that fluid intake driven by thirst alone is adequate for maintaining performance and recovering properly after exercise. This is especially the case in distance runners, to whom overhydration and subsequent hyponatremia (dangerously low sodium levels in the blood) can easily happen due to a fear of not drinking enough. In this thirst-driven approach, athletes should therefore consume both water and sports drinksthroughout their training and competition and follow their thirst to guide intake. 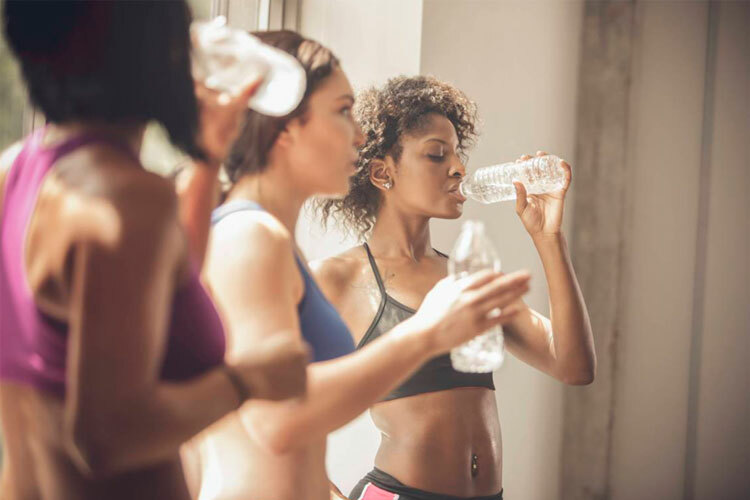 While mild levels of dehydration may occur, some studies show that thirst-driven intake adequately replaced losses in the 24 hours following a workout. So which of these schools of thought is right for you? There are lessons you can take from each of these perspectives to craft your own personal hydration strategy. As with all elements of sports nutrition, finding your perfect routine comes from practice. Track your weight before and after exercise to get a general idea of how much you sweat. If you lose more than 2% of your body weight during a workout, you may need to drink more fluid. Conversely, if you gain weight during a workout, you probably drank more fluid than you needed. Try listening to your thirst cues to see if it better guides your intake. If you have to urinate frequently during exercise, you may be drinking too much. If you have small amounts of dark urine during the day of your training, you probably did not drink enough or rehydrate with enough fluid. Whenever you begin a new season of training or your climate changes to hotter or colder temperatures, a set hydration strategy may be beneficial. Start with a guideline of 4–6 sips of fluid every 15–30 minutes. When stakes are low, practice listening to your thirst as your guide for drinking during training. Use the first three suggestions above to determine how successful you were. If you are a slower-pace endurance runner (a marathon runner with a pace of 4 ½ hours or longer), be mindful of overhydrating during long runs and races. Use your thirst, weight change and urination rate to determine the best hydration strategy for you. Ensure you start your workout adequately hydrated. Urine volume and color can be a good indicator. A small amount of dark-colored urine likely indicates low hydration levels. Be aware of the symptoms of dehydration: dry mouth, headache, fatigue, dry skin, rapid heartbeat, rapid breathing and dizziness.